There are higher expectations for women in the fields of science and engineering. 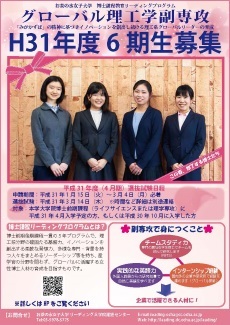 The degree program entitled “Fostering long-term creativity and innovation with science and technology disciplines based on Ochanomizu spirit ‘Migakazuba’ in the next generation of global leaders”, aimed at female students with a fundamental knowledge of physics, mathematics, and computer science, will endow them with the knowledge and ability to respond to changing situations and varying needs of society while continuing to forge innovation. Collaboration between industry, educational institutions, and the administration allows Ochanomizu University to become the hub and proponent for this program. This program has set forth the following educational goals: “achievement of reliable fundamental skills” and “innovation in research and development in the real world and fostering leadership in collaboration with different fields.” To realize the latter goal, this program introduces PBTS (Project Based Team Study) as the main method, which allows students to practice effective project management and team research. This five-year program is provided through the “Minor Course of Science and Technology for Global Leaders” established by a collaboration between the Division of Advanced Sciences and the Division of Life Sciences. This program cultivates female postdoctoral students who have fundamental skills in science and engineering, the flexibility to create innovation, and the leadership skills to organize people from different fields and backgrounds. These students are preparing to play active roles in the fields of industry, educational institutions, and administration on a global level. 1) Individuals expecting to enroll in the following Master’s major courses in April 2019, or individuals enrolled in the following Master’s major courses in October 2018. 2) Individuals who will pursue doctoral studies in the course. Please see 2019 Guideline for Application for International Students (April Enrollment):Minor Course of “Science and Technology for Global Leaders”. Please visit our website for Leading Graduate School Program for details. Students form teams based on their research topic program and subsequently work on solutions for self-imposed tasks. Topics relevant to solutions to various problems are identified in discussions held from an international point of view. The research is characterized by interdisciplinary perspectives comprising topics as diverse as factory drainage, educational tool development, propositions for addressing aging population issues, and myocardial cell models. ⇒ A master’s thesis can be substituted with Minor Course coursework and research (for students who enroll from the first year of the master’s program). ⇒ Students will develop skills in planning, leadership, and project management. ⇒ Students use English in research and discussion under the guidance of foreign faculty members. ⇒ Students are required to participate in overseas activities while in school. ⇒ Students will conduct research in an English-language environment while in Japan. ⇒ Subjects are developed in cooperation with female executives from companies and global NGOs. The doctoral program LA (liberal arts) is required to learn philosophy, history, and culture in English. ⇒ Students will acquire knowledge necessary in a global society. ⇒ Degree titles vary according to student’s field of study: science, engineering, or academic. Exit strategy for students is planned in collaboration with industry. ⇒ This program develops career plans including employment at companies and research institutes. A scholarship will be provided to students who apply for and pass the selection process. * The scholarship will be applied until the end of 2019 academic year.